The Village Coquettes: A Comic Opera in Two Acts; the Music by John Hullah. London: R. Bentley, 1836. 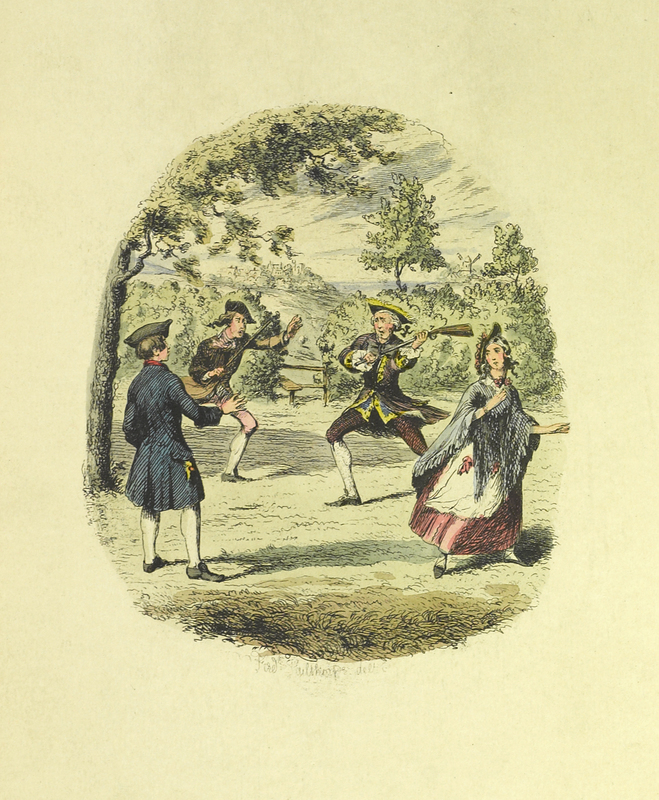 This operetta, one of Dickens’s earliest publications, is a collaboration between Dickens and John Hullah. Hullah (1812-1884), an acquaintance of Dickens’s sister Fanny from the Royal Academy of Music, was thought to have become associated with the author in 1835. Dickens was working as a reporter for the Morning Chronicle at that time. In general, reviews were favorable for the music, but not for the libretto. The Posthumous Papers of the Pickwick Club. London: Chapman and Hall, 1874. 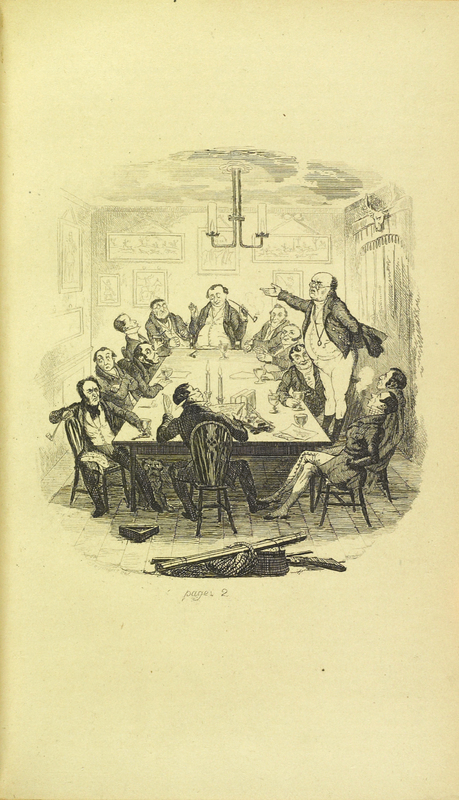 The Pickwick Papers is the novel that catapulted Dickens to fame. Originally conceived as a series of comic illustrations by noted artist Robert Seymour, Dickens was recruited to provide accompanying text for the illustrations. By the end of the second number, Dickens had assumed control of the project, diverting the focus to the text from the illustrations. Robert Seymour was replaced at the end of the second number with Hablot K. Browne, who adopted the pseudonym of Phiz for this project to complement Dickens’s pseudonym of Boz. The Posthumous Papers of the Pickwick Club; with Forty-Three Illustrations by R. Seymour, and 'Phiz'. London: Chapman and Hall, 1837. Illustrating this novel was a group effort. Robert Seymour (ca. 1800-1836), Robert William Buss (1804-1875), and Hablot Knight Browne (1815-1882) collaborated with Dickens to breathe life into Dickens’s characters. Buss was contracted to finish the work after Seymour’s untimely death, but was fired after contributing only two plates, which were never used. Hablot K. Browne replaced Buss. 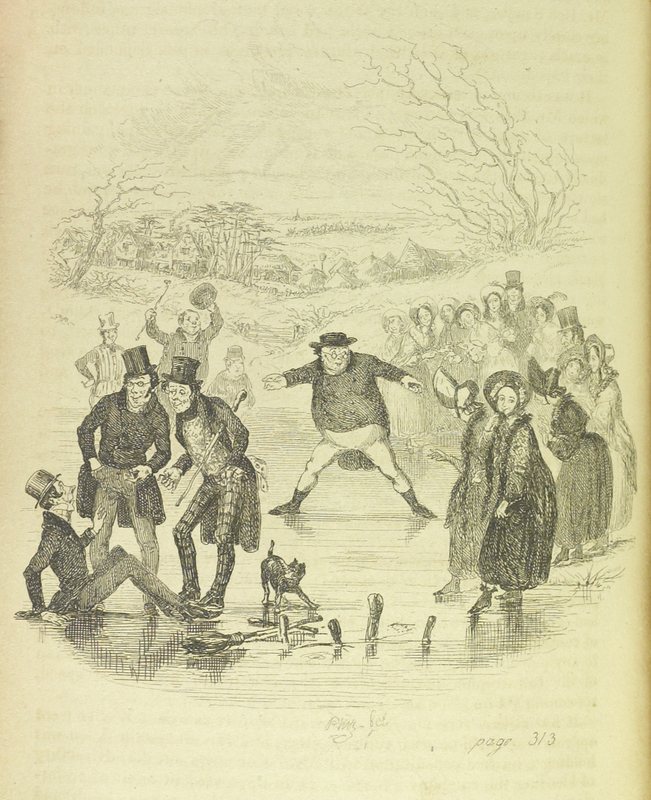 Browne would illustrate Dickens’s books for the next twenty-three years. Oliver Twist; or, The Parish Boy's Progress. By "Boz" [pseud.] London: Richard Bentley, 1838. This is the first appearance of Oliver Twist in book form. It first reached audiences as a serial and was issued in parts. 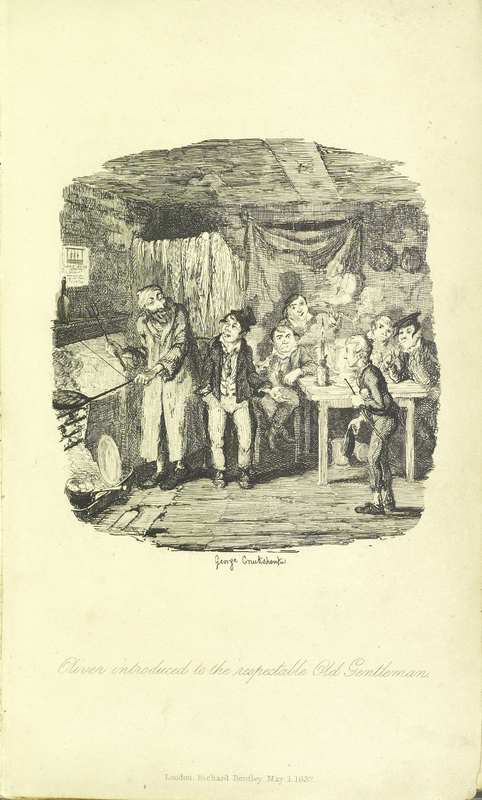 Illustrated by George Cruikshank (1792-1878), this edition is known as a “three-decker”, a term used to describe 19th-century novels published in three equal volumes. Volume 3 includes the suppressed "Fireside" plate. This copy formed part of the library of B. George Ulizio, a book collector, before it was acquired by another renowned bibliophile, Lehigh alumnus Robert B. Honeyman, ’20. 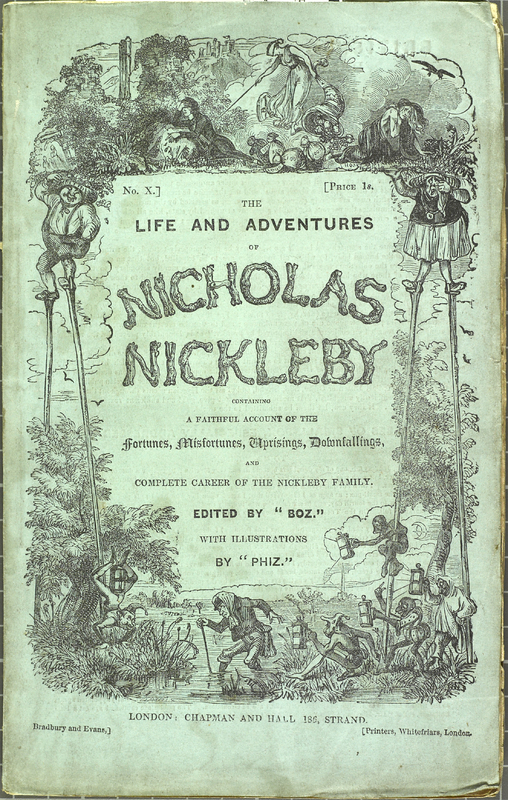 The Life and Adventures of Nicholas Nickleby, Containing a Faithful Account of the Fortunes, Misfortunes, Uprisings, Downfallings, and Complete Career of the Nickleby Family, ed. by "Boz". With Illustrations by "Phiz". London: Chapman and Hall [1838-1839]. 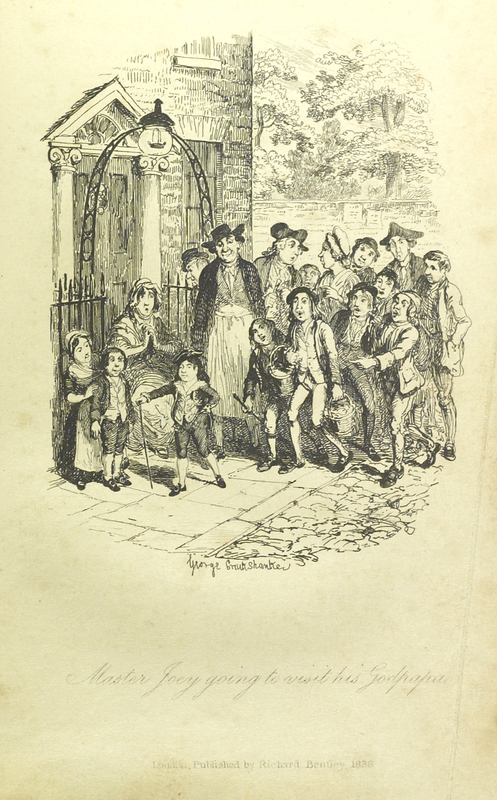 This was the first appearance of Nicholas Nickleby, issued in twenty numbers in nineteen parts. It appeared monthly, from April 2, 1838, to October 1, 1839, in illustrated blue paper covers. Illustrations were provided by Phiz, the pseudonym of H. K. Browne. Nicholas Nickleby follows the trials and successes of young Nicholas as he makes his way in the world after his father’s death has left his family in a state of genteel poverty. Along the way, he meets such unforgettable characters as the evil schoolmaster, Wackford Squeers and that child prodigy of the stage, the Infant Phenomenon.